Despite learning about his grandmother's demise just hours earlier, Andrew Tye put in a brilliant performance to reclaim the Purple Cap. While it is expected of a sportsman to be professional and match ready at any point of time, it can be extremely tough to put on a game face of the back of personal tragedy. 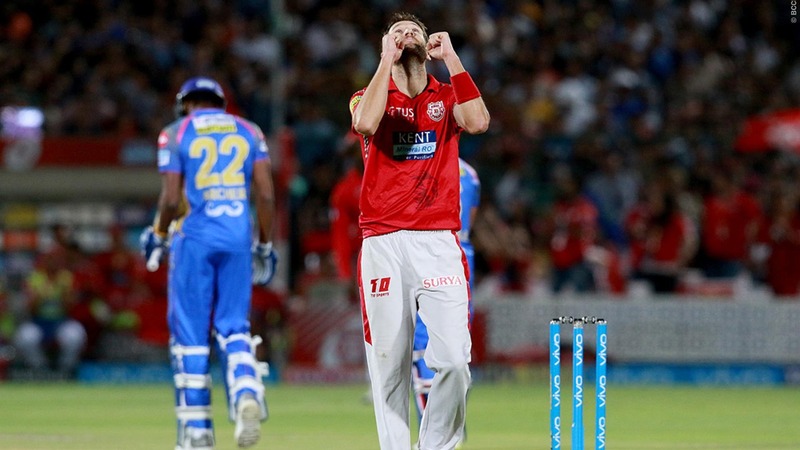 Such was the case for Kings XI Punjab bowler Andrew Tye, who learnt about the demise of his grandmother the morning of his VIVO Indian Premier League against Rajasthan Royals. However, the pacer showcased great resilience and strength on the pitch, delivering his second-best performance for the season. Playing against Rajasthan Royals at the Sawai Mansingh Stadium in Jaipur, captain Ravichandran Ashwin lost the toss and had to settle for bowling first. Ashwin handed the ball to Australian Andrew Tye in the fourth over in the search for a breakthrough in the powerplay. The seamer duly obliged, with a knuckle ball that completely outfoxed Royals captain Ajinkya Rahane who chipped it straight to extra-cover. However, Jos Buttler held the fort from the other end, building partnerships first with Sanju Samson and then Ben Stokes who scored 22 and 14 respectively. Butler scored a blistering 82 off just 58 balls, contributing to more than half of the team's score. To counter Butler's aggression, Ashwin reintroduced Tye into the attack to keep the economy rate in check. The speedster picked up the wicket of Stokes in his very first comeback over and also contributed in the run-out of next batsman Stuart Binny. Then in the final over of the game, Tye dismissed the explosive Jofra Archer off the very first delivery with another well-disguised knuckle ball which was haplessly chipped in the deep for an easy catch. The Australian finished his spell in sublime fashion, hurrying Jaydev Unadkat to his shot to have him caught in the deep by Karun Nair. And as the wickets fell, Tye was seen celebrating them by kissing an armband on his left forehand, with the letters 'GRANDMA' written on it. Tye ended the day with 4-34 in his quota of four overs, to further consolidate his hold on the Purple Cap. He was involved in the wickets of the last four batsman, which included the run out. As a result, the last two overs produced just 11 runs. "Just trying to change it up and not to be to predictable. My grandma passed away today, so I'd like to dedicate this performance to her and all my family," he said, welling up. “This has been an emotional match for me. It was a pretty tough day, I always love playing cricket." Andrew Tye, Australian Fast bowler playing IPL for KXI Punjab takes 4 wickets, then wells up saying his grandmother passed away earlier today and he played sporting an arm band saying so. The pain of mortality. In response, Kings XI Punjab lost wickets at constant intervals with Lokesh Rahul waging a solo war to salvage the chase. The Karnataka man scored a valiant 95 but none of his compatriots crossed 15 as the Kings ultimately fell short by 15 runs. In the face of adversity, a person's true character gets tested and only the very best manage to come out of it with the heads held high. Kings XI Punjab's AJ Tye showcased his resilience and character by churning out a superstar performance when he was going through tough times in his personal life.